Yep. This is my review! Writers: Oren Uziel (screenplay by), Oren Uziel (story by) | 1 more credit ??? Lest we forget, and for those who’ve yet to see J.J.’s gem, CLOVERFIELD (2008) was a superbly imaginative Sci-fi horror with gruesome intergalactic entities, big and small, sleazy and vicious, dispatching grisly harm to men, women and children as well as skyscrapers, bridges and other Manhattan real estate. Battle scenes of tanks and armored half-tracks rushing through lower Manhattan, firing cannons and getting squashed by an ungodly ugly, extraterrestrial big foot seemed authentic. It was sassy end-of-the-world, found-footage, sci-fi-horror-action-adventure-drama and that helped me to accept a so-so subplot (there are those who disagree, believing it was more intricately involved in the plot) about a yuppie-(pre)millennial love affair with its flourishes of juvenile infidelity and when-would-it-be-revealed and does-it-really-matter. Yawn. And, at the end, in New York’s Central Park, it didn’t matter. CLOVERFIELD had depth. The plot was unpredictable, and something gruesome would show up unexpectedly on that big screen without warning, such as subway rats fleeing ugly creepy crawlies that had rolled off the huge body of ET Bigfoot like ribbons of fierce wrath and scuttled through subway tunnels closing in on fresh human meat – because the rats scuttled faster to safety than the humans. Recall the ghastly horror Lizzy Marlena Diamond (played by Lizzy Caplan) suffered!!! If you didn’t see the scene, imagine snatches of plot elements having Freddie Kruger meeting up with Rosemary’s Baby with a toss of H.R. Giger’s Alien – all on steroids. So, it should be easy to understand my contempt for CLOVERFIELD PARADOX. Resentment had been swelling in my heart and soul well before this J.J. Abrams Caspar Milquetoast because of all the teases over the years about a CLOVERFIELD sequel coming to the fore. 10 CLOVERFIELD LANE, starring the winsome and savvy Mary Elizabeth Winstead and veteran thespian John Gallagher, Jr., was released in 2016, and I swear to god that I read disclaimers that 10 CL had nothing to do with the original CLOVERFIELD and then later accounts that it indeed was connected. 10 CL, I gave it ** because of Winstead and Gallagher, though I felt J.J. was @+&%! playing with our minds. And then I discovered published accounts that it was part two of a franchise. A franchise! There are scary scenes! But the flick is still a dud. Courtesy of Netflix, Paramount. Other reviewers dud-ed it too but there were many others who accepted it as a plus for the franchise. Well, not me. 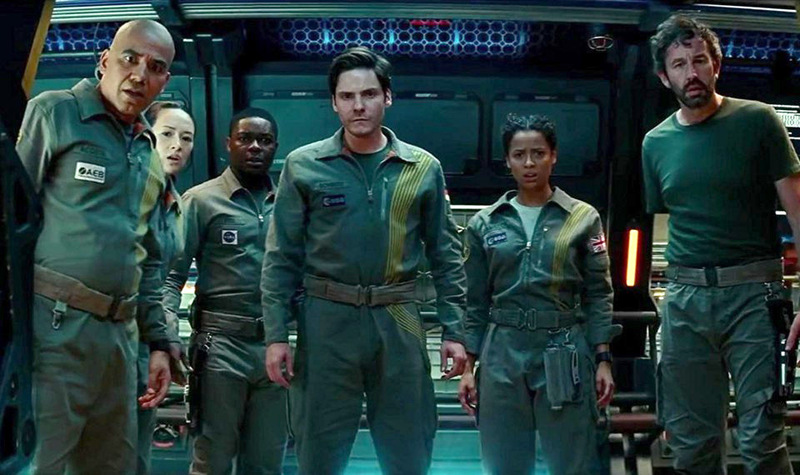 Here’s a spoiler: CLOVERFIELD PARADOX, the paradox referring to another dimension in space and time with clones of scientists on the space station to keep some of us – many of us??? – mesmerized like a deer caught in the headlights of the speeding car bearing down on it. We are never going to see the real sequel that we deserve. Looks apocalyptic. But the movie is a dud and who cares? Courtesy of Netflix, Paramount.